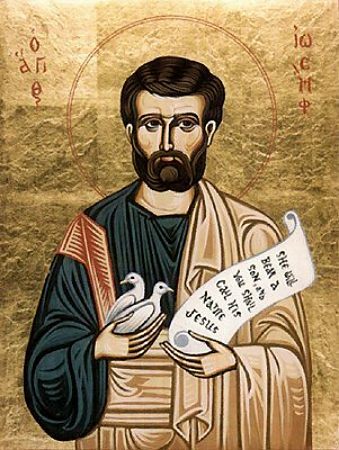 Saint Joseph the Betrothed was descended from the lineage of King David. In his first marriage, he had four sons and two daughters. Having become a widower, Saint Joseph led a life of strict temperance. As an eighty year old elder Saint Joseph was chosen by the high-priests as a protector of the virginity of the MostHoly Mother of God, Who had taken a vow of virginity. An Angel announced to him about the Incarnation through Her of the Son of God. Saint Joseph was present during the worship of the NewBorn Divine-Infant by the shepherds, and also by the Magi. On the orders of the Angel he fled with the Mother of God and the God-Infant Jesus into Egypt, saving them from the wrath of king Herod. In Egypt he lived with the Virgin Mary and the God-Infant, earning his livelihood by work as a carpenter. Saint Joseph died at about one hundred years old (a 2nd Commemoration of Saint Joseph is on the Sunday of the Holy ForeFathers).